If you were born today in Africa, you would face the same risk of dying in your first month of life as if you were born during World War II in Great Britain. That’s 11 times greater risk than British babies face today, seven decades later. Somalia is Africa’s most dangerous country to be born, with a risk almost 20 times higher. 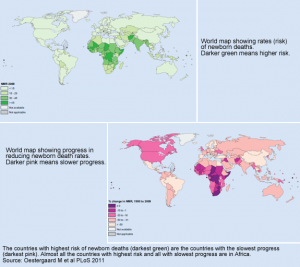 PLoS Medicine has just published a new study on newborn deaths by the World Health Organization, Save the Children and partners showing that, increasingly, a baby’s chance of surviving the first month of life depend on where that baby is born. The world is gradually reducing how many newborn die, but progress isn’t fast enough. Our estimates for 193 countries over 20 years show that newborn deaths decreased from 4.6 million to 3.3 million. But the global newborn mortality rate is reducing at only 1.7% per year, about one third slower than annual declines in maternal mortality and child mortality. 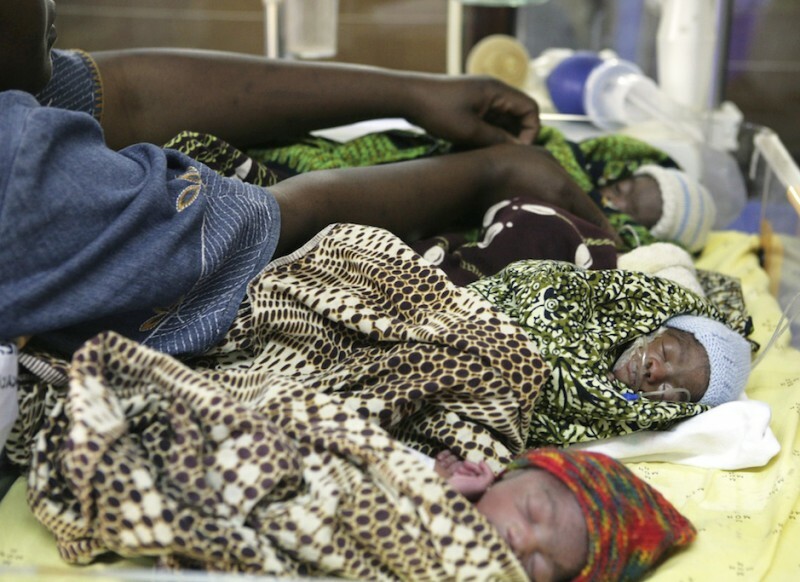 In Africa, newborn mortality is going down even more slowly, at under 1% a year. Most shockingly the rate of reduction is slowest for those countries with the highest risk of newborn deaths. Fifty countries have reduced newborn death rates by over 50% – none of these countries in Africa. Almost 240,000 newborn deaths occur in Nigeria each year, one of the few countries globally with increasing numbers of deaths. Nigeria now ranks second to India for the biggest number of newborn deaths. Africa has only 11% of the world’s population, but our study shows that one third of the world’s annual newborn deaths are African. Until recently, newborn deaths have received far less attention than other health priorities on the continent, such as HIV/AIDS, which annually causes around 200,000 child deaths under age 5, and malaria, which causes around 730,000. To further reduce child deaths we need to also pay more attention to newborns. The deaths of 1.1 million African babies are mainly from highly preventable conditions such as infections and moderately preterm birth. Newborn deaths can be reduced by over half in 10 years with preventive care such as breastfeeding, cleanliness and warmth, combined with highly feasible curative care such as antibiotics and kangaroo mother care. Yet lifesaving care is failing to reach mothers and their newborns. Why should an African mother be left to grieve for her newly born baby just because she is in Africa? This must change. And it can, as countries like Egypt have shown, halving newborn deaths since 1990, or Eritrea and Malawi two of the higher performing sub Saharan Africa countries. If we prioritize frontline health workers close to families, we can make sure all babies receive the basic care they need to survive. At the current rate of progress it will take until the year 2166 for African babies to have the same chance of survival as a baby born in Europe or North America today. This risk reduction was achieved in around 70 years in high income countries – so why should we accept that Africa should wait will have over 150 years from now? We should be able to move faster than we did before given the huge advances in technology and innovations. I was born as a baby in Africa in a bush hospital with no running water and no electricity. My family, the midwife shouted out for my mother and me. I survived because people there expected me to survive. While we Africans and the rest of the world accept that it is alright for a baby to die because they are African, progress will continue to be too slow. We need a movement of mothers, and frontline health workers around the world to say that needless newborn deaths are not acceptable. Such a movement changed AIDS care in Africa within 5 years from inevitable death to a right to treatment. Such a movement changed malaria deaths in Africa from deaths to rapid roll out of bed nets. Such a movement changed maternal deaths from accepted tragedy to a right that no woman should die giving birth. Where is the movement to change newborn deaths, especially in Africa, from just one of those things to an unacceptable loss, to prioritizing provision of frontline healthworkers at birth for mothers and babies and lifesaving care for all babies, wherever they are born? Will you be a part of that movement? Are you an impatient optimist for change for the world’s newborns?